Phase interference of microwave images has been experimented for remote submillimeter-accuracy detection of structural displacements of a real-scale building subject to tensional stress. The images are obtained by a synthetic-aperture interferometric radar operating in the near field, making use of continuous-wave stepfrequency waveform. Phase information of the synthesized microwave images is exploited for detecting displacements of the illuminated structure. 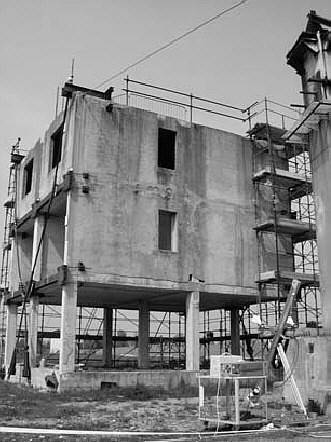 Monitoring of structural displacements of civil engineering constructions as dams,bridges, towers, industrial plants, as well as of historic Heritage buildings, is of basic importance to identify stability problems at an early stage and to enable cost-effective remedial action to be taken [1,2,3]. Monitoring sensors should provide real-time information on overall movements of structures relative to fixed positions over an extended time to measure sway movements, daily and seasonal movements, creep and tidal and load induced movements. Measurements to determine the relative movement of the structure components, of its foundations, surrounding ground, and adjacent buildings are important as well . Monitoring is currently implemented by a variety of sensors, such as networks of optical targets installed over the structure, strain gauges to measure deformations,collimation nets to measure displacements, inclinometers to measure rotations. Such sensors are accurate and reliable, but require contact with the structure to be surveyed, and information is local to the specific point of the sensor position. Monitoring large structures gives rise to accessibility problems, calling for expensive scaffolding and network for transmission of data to a remote collection station [3,4]. In a number of situations, moreover, placing of sensors on the structure is not possible or is too time consuming. This is the case of buildings with symptoms of impending collapse, for example after a seismic shock or an intentional injure. In all these cases, remote sensing techniques are required because they are scanning the structure from safety distance and are providing displacement maps of large illuminated areas with immediate evidence. Ground-based radar systems operating interferometric survey using techniques analogous to those used from space, as first proposed by Tarchi et al . The application of these radar techniques have been demonstrated in a pseudo-dynamic test of a building  and in a load test of a bridge . 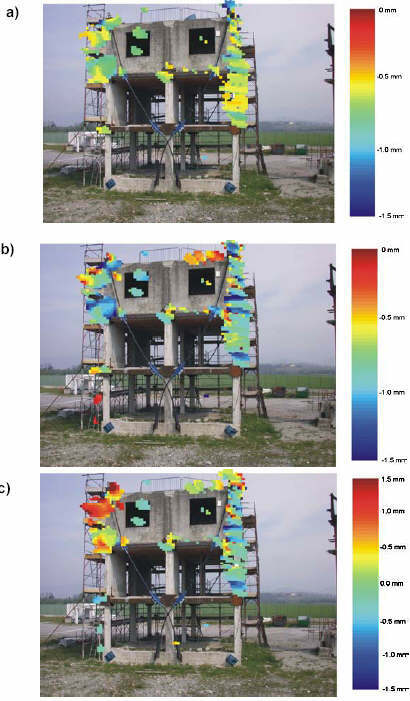 In this paper a portable microwave instrument based on Differential Interferometry,capable of high resolution remote detection, is briefly described, and the results of a measurement campaign conducted on a real-scale three-floors concrete building subject to a static load test are reported. Fig 1: Scheme of the radar system. The square modulus of the holographic images gives the radar cross-section (RCS) map.The complex product, pixel by pixel, of a pair of holographic images, relative to different states of the structure under test, gives an interferogram. By assuming that the dielectric properties of the target are unvaried, a phase shift in an interferogram pixel is related to a local target displacement. The radar technique is able to measure only the displacement component in range direction, but simple static and geometrical considerations allow the phase shift at each pixel to be related to the actual displacement . The test building, shown in figure.2, was a concrete three-floor structure 9.0 m high, 7.6 m wide, and 9.4 m long. The second and third floors had external and internal walls,while the ground floor had only the concrete bearing pillars. The radar equipment was positioned at about 15 m distance in front of a building facade. The linear guide was positioned on a plane perpendicular to the building wall at an angle of 12 degrees with respect to the normal to ground (Figure 2). Fig 2: View of the test building and of the radar equipment. The cable fixed at the upper left corner of the building serves to apply the deformation force. This set-up provides radar images focused on the vertical plane. The resolution in image plane is related to the swept bandwidth and to the mechanical guide length , while the horizontal resolution is related to the angular width of the antenna mainlobe (15 deg of half-aperture). The radar operation parameters are summarized in Table 1;frequencies in the bandwidth and antenna positions along the linear aperture are varied at uniform steps. 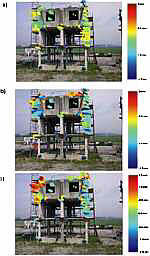 The upper part of Figure 3 shows a RCS radar image of the building taken using VV polarization superimposed to a picture of the scenario, the radar being positioned in front of the right wall. It is to be particularly noted that internal floors and the wall on the opposite side with respect to the radar installation are clearly detected. Thus, the system offers intra-wall imaging capability. The correspondences between features in radar image and in the picture appear evident. The lower part of Figure 3 shows the same RCS radar image in logarithmic scale. Fig 3: Above, RCS radar image of the building taken using VV polarization superimposed to a picture of the scenario. Bottom, the same RCS radar image in logarithmic scale. In order to cause calibrated displacements in building structure, a cable was fixed to the upper corner of the building in front of the radar (Figure 2), and a force was applied to the building through a winch. A load cell measured the applied force, and an optical instrument measured the displacements along the horizontal direction of a target bonded to the concrete pillar at the third floor, with an accuracy better of +/- 0.05 mm. Radar images were taken before the application of the force, during the applications of forces of increasing values ( 1176 Kg and 1659 Kg ), and after the force was removed. 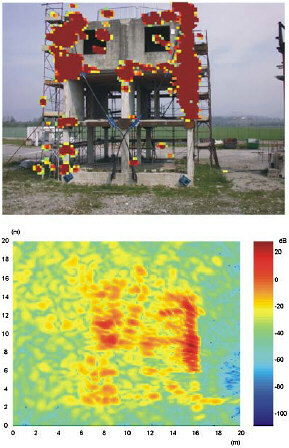 Figure 4-a shows the result obtained from the phase interference of the image of the unloaded building and the images obtained by applying the load of 1176 Kg. The interferogram phase shifts are converted into effective displacements along the horizontal direction, and the deformation pattern is evidenced by the use of color code.Figure 4-b shows the interferogram related to the application of the 1659 Kg load. Changes of color code immediately evidence the increase of structure deformation. The displacement of the pillar along the horizontal direction in proximity of the optical target, during the application of the biggest load, was of 1.10 mm in good agreement ( " +/- 0.2 mm) with the displacement of 1.28 mm measured by the opticalinstrument Finally, an interferogram between the image acquired before the application of the solicitation and an image taken after the solicitation desistance was evaluated. The resulting pattern shown in figure 4-c evidences an unexpected spreading effect of the two external opposite walls along the solicitation direction, denouncing a no-elastic behaviour of the building structure. Fig 4: a) Interferogram between images taken without applied load and with a load of 1176 Kg, respectively. The phase values of the interferogram are converted in effective displacements along the horizontal direction. b) Interferogram between images taken respectively without applied load and with a load of 1659 Kg, respectively. The phase values of the interferogram are converted in effective displacements along the horizontal direction. c) Interferogram between an image acquired before the application of the deformation force and an image acquired after the force desistance. The remote sensing technique described in this work is based on synthetic aperture operation of a ground-based radar, and requires a simple equipment that can be easily transported and positioned. Suitable image processing provides effective mapping of structural displacements of buildings, and color code representation offers immediate evidence of such displacement map. The intra-wall imaging capability of microwaves can allow also to detect displacements of hidden parts of the structure under test. Even though at the state of art this instrument does not achieve the accuracy and reliability of the conventional contact sensors, it can be remotely operated also from great distances,can be rapidly installed also in emergency situation, and is able to provide displacement maps of immediate readability. This work has been carried out with the support of the PARNASO-MATER Project, partially funded by the Italian Ministry of Scientific Research, aimed at developing innovative technologies for Cultural Heritage protection and conservation. D. Tarchi, H. Rudolf, M. Pieraccini, and C. Atzeni, "Remote monitoring of buildings using a groundbased SAR: application to cultural heritage survey", International Journal of Remote Sensing, Vol. 21 (2000), 3545-3551. K. Iizuka, A.P. Freundorfer, K. U. Wu, H. Mori, H. Ogura, V. K. Nguyen, "Step-frequency radar",Journal of Applied Physics, Vol. 56 (1984), 2572-2583. M. Pieraccini, G. Luzi, C. Atzeni, "Terrain mapping by ground-based interferometric radar", IEEE Transactions on Geoscience and Remote Sensing, Vol. 39 (2001), 2176-2181.